So all 4 kids have the same DNA right? Imagine all the people they could kill and get away with it! @WelI Obviously, now I'm no paleontologist, but I don't think that's how that works. @WelI Obviously, I don't care what you're talking about. "Poppy pooperson" gets an upvote. @WelI Obviously, actually no, if anything they are genetic full siblings instead of cousins or genetic half-siblings. @MattedPenguin, Not quite randomly. They are grouped by chromosomes, with half of each chromosome pair coming from each parent. With 23 pairs of chromosomes, the chances any sperm or egg being identical from the same genetic source is 1:2^23 or 1 out of 8,388,608. That means over 64 trillion chromosome combos from any two (normal) genetic parents. This does NOT include genetic abnormalities like chimerism or imperfect splits, etc. @WelI Obviously, yes, genetically the kids are siblings. 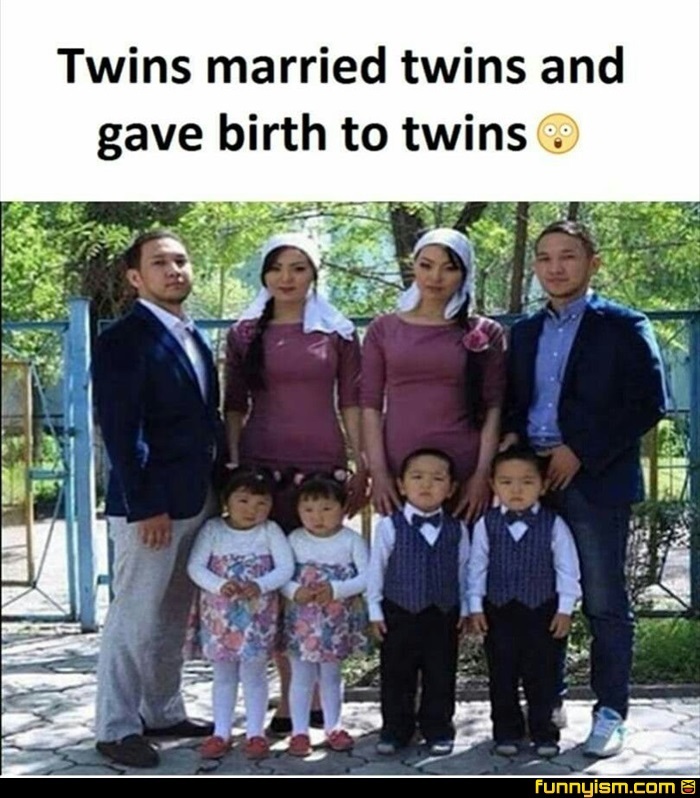 Wouldn't that make each pair of twins brother and sister...? @AbbyBorden27, Genetically yeah. The brothers carry the same genes and are recombined with females who have their own same genes. Regardless of the outcome, all offspring from both parties are in a genetic sense, as close as siblings. Both wives: we're all gonna match. Both men: yeah, we're not doing that. Technically both sets of kids are all siblings, not cousins. They seem to only be... Moderately pleased with how their lives turned out. (sarcastically echoed) What are the odds.